Leac Chonaill is the name of a stone near the holy well of St. Conall. Recesses on it are said to be the marks of the saint's knees and elbow (Kay Muhr, Celebrating Ulster's Townlands, p. 23). Leac Chonaill also gives its name to the townlands of Derryleconnell Far and Derryleconnell Near. 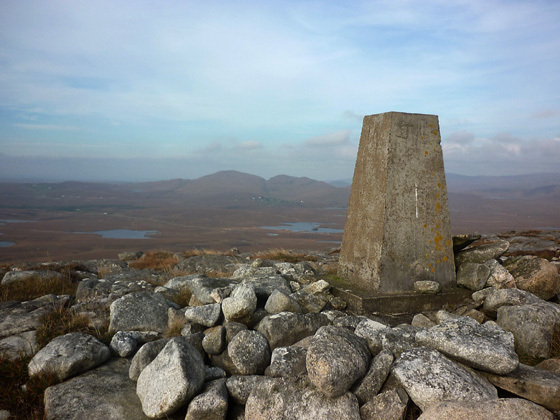 Cruach Leac Chonaill is the 1241th highest place in Ireland. Picture from Harry Goodman : Looking N to Crovehy from Croaghleconnel summit. Picture: Looking N to Crovehy from Croaghleconnel summit. A hill to enjoy but save it for a fine day.